Gullfoss is one of the most popular tourist attractions in Iceland. The wide Hvítá rushes southward. About a kilometer above the falls it turns sharply to the left and flows down into a wide curved three-step "staircase" and then abruptly plunges in two stages (11 m and 21 m) into a crevice 32 m (105 ft) deep. The crevice, about 20 m (60 ft) wide, and 2.5 km in length, is at right angles to the flow of the river. 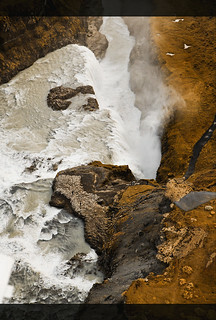 As one first approaches the falls, the crevice is obscured from view, so that it appears that a mighty river simply vanishes into the earth. The average amount of water running over this waterfall is 140 m³/s in the summertime and 80 m³/s in the wintertime. The highest flood measured was 2000 m³/s.